Do You Remember... "Walt Disney Presents..Andy Burnett". 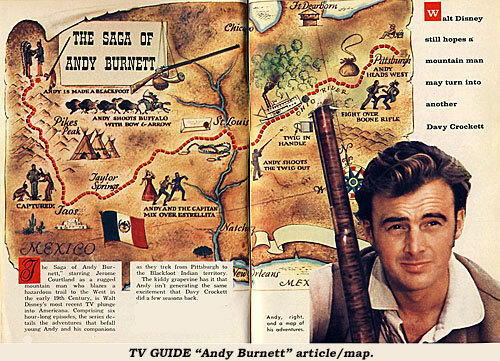 Buoyed by their success on the frontier with “Davy Crockett” (‘54-‘55) and “Zorro” (‘57), ABC wanted more westerns from Walt Disney, so Uncle Walt gave them to the network beginning Oct. 2, 1957, on “Walt Disney Presents” starting with “The Saga of Andy Burnett”. 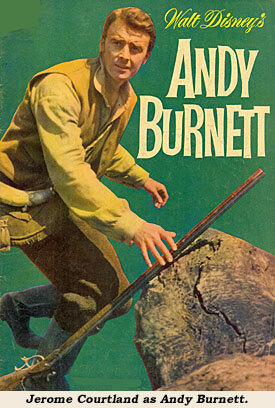 Unlike “Davy Crockett” or the Disney Westerns to come, “Andy Burnett” was not based on actual fact but came from the historical stories of Stewart Edward White first serialized in SATURDAY EVENING POST. Lanky juvenile Jerome Courtland portrayed Andy, an aspiring frontiersman from western Pennsylvania who traveled west in the 1820s to become a mountain man in the Blackfoot Indian Territory. Burly Jeff York as Joe Crane, Andrew Duggan as Jack Kelly and Slim Pickens as Old Bill Williams were Andy’s mountain men mentors. Six 60 minute color episodes were shown through 3/12/58 on Wednesday nights from 7:30-8:30 ET on the fourth season of “Walt Disney Presents. Andy’s saga focuses on the mountain side of White’s stories more than the migration to California. For TV Andy never expresses an intention to travel to the coast but seeks to settle permanently in the mountains. The first three episodes delineate Andy’s migration from east to the Rocky Mountains while the next three episodes relate problems with the Indians. Star Jerome Courtland was born December 27, 1926, in Knoxville, TN. In 1944 he was screen tested by Columbia director Charles Vidor and subsequently signed to a seven year contract, appearing as a juvenile in several comedies—before wartime service in the Pacific. After WWII he co-starred in several Westerns—“Man From Colorado” (‘48) w/Glenn Ford, “The Walking Hills” (‘49) and “Santa Fe” (‘51) w/Randolph Scott, “Texas Rangers” (‘51) and “Cripple Creek” (‘52) w/George Montgomery. He starred in “The Palomino” in ‘50 and had a good role in director William Wellman’s classic “Battleground” in ‘49. Courtland switched to directing and producing (“Flying Nun”, “Love Boat”, “Dynasty”, “Falcon Crest”). Returning to Disney he worked on several films and was associate producer on “Gallegher Goes West” in ‘67. He moved to Chicago in ‘97, teaching drama and directing at Columbia College for five years before retiring in Florida. The 6'4" Courtland died at 85 March 1, 2012, in California’s Santa Clarita Valley.